If you use the GSP Amazon link Amazon will donate a portion of the sales to help support genealogical education and resources offered by the Genealogical Society of Pennsylvania. Thank you so much! GSP participates in the 23andMe DNA Affiliates Program. For each kit you order by clicking the GENPA23andMe link, GSP receives $10. Please consider purchasing through GSP, and share the link to family and friends. GSP is now participating in the Ancestry.com affiliate program. 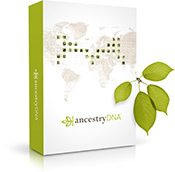 Please help support genealogical education at GSP by ordering Ancestry through the GSPAncestry Link. Thank you!